The LANCOM workshops offer you the opportunity to directly acquire LANCOM specific knowledge. Through a specific transfer of know-how from the manufacturer to the LANCOM partner, it is ensured that, after the workshops, you can configure LANCOM devices even more efficiently and competently and can better realize network scenarios. With its own training center, LANCOM has the claim to successfully secure the specific know-how transfer from manufacturer to specialist dealer and technician. Use your additional knowledge after the workshop more efficiently when configuring LANCOM devices and implementing solutions. Specialists, System House Technicians, System Administrators and IT Decision-makers benefit from our optimally coordinated workshops. The Specialist workshops are optimally adapted to the needs of technicians, network administrators and retailers and build on the knowledge that was given in the Professional Workshops. 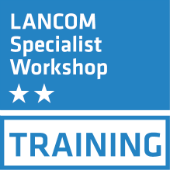 The workshops provide all the important knowledge necessary for the planning, commissioning and administration of professional network structures with LANCOM devices. The topics covered are implemented without an assistant in the practical part and are summarized at the end of the workshop in a comprehensive scenario. The LANCOM certifications are a suitable means to prove comprehensive network know-how and to stand out from a mass of providers as an expert. With a certification of profound technical knowledge, you can prove your expertise and convince your customers. In the LANCOM workshops, you have personally demonstrated that you are using LANCOM products to plan complex scenarios and successfully implement solutions. Take the opportunity to present yourself through a theoretical and practical exam. LANCOM certifications entitle you to take a LANCOM qualification title. The certificate issued on your behalf confirms your expertise and has a validity of 2 years from the date of the examination. For questions about the LANCOM workshops, as well as for advising individual trainings, feel free to contact us.